Sky Vision, NHK, Channel One Russia and Sony all revealed major new shows at MIPCOM 2017. Here's how! One of the biggest shows making its debut at MIPCOM was Britannia, a Sky Original production created by award-winning writer Jez Butterworth (Spectre). It’s actually a coproduction with Amazon US, set in 43AD when the Roman army invades Britain, and encounters violent resistance from the Celts and Druids. The MIPCOM World Premiere Screening was followed by a Q&A with stars David Morrissey (who plays Roman general Aulus Plautius), Nikolaj Lie Kaas (who plays outcast druid Divis) and Eleanor Worthington-Cox (who plays Cait, a 12 year-old girl separated from her family). They were joined by executive producer James Richardson (above). He explained that the idea originally came from an idea to do something on Celtic queen Boudicca, before diving deeper into that time and its myths. “I just wanted to really discover all the stuff about Stonehenge, Avebury, the druids. It felt like a world we hadn’t seen [on screen]before: British myth,” he said. The Britannia theme song is Scottish singer/songwriter Donovan’s folk-rock classic Hurdy Gurdy Man, and he was present in the audience for the premiere to proudly explain that “it’s been waiting for something as brash and bold and as richly-tapestried as this”. The highly anticipated screening of Kurara: The Dazzling Life of Hokusai’s Daughter took place Tuesday morning. It marks the first-ever Asian world premiere at MIPCOM, as well as the first Palais screening in 4K. Kurara begins with the story of Katsushika Hokusai. Among Japan’s most renowned 19th-century ukiyo-e artists, he’s known worldwide for such works as “Red Fuji” and “The Great Wave off Kanagawa”. Little, however, is known of Hokusai’s private life. It turns out he had a daughter, O-Ei, herself a brilliant painter who felt painting was kurara (a Japanese word for “dazzling”). She was briefly married, but—given the choice between art and matrimony—quickly returned home to become her father’s assistant, sitting at Hokusai’s side as he completed his iconic “Thirty-Six Views of Mount Fuji” series. When Hokusai grew too old to wield a brush, O-Ei painted for him. So this is more a story about O-Ei, a little-known Japanese woman who perhaps shared her father’s brilliance but never escaped the scope of his name … or the duties of a child and apprentice. It’s also a story about the love between a father and daughter, and how one woman created her own unique painting style—composed of plays of shadow and light—under the shadow of a genius. 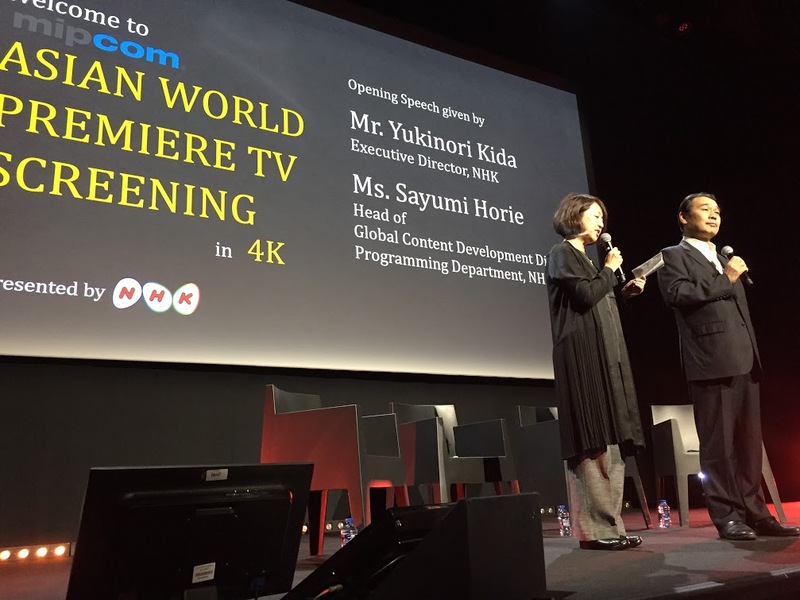 Ahead of the screening, Reed Midem’s director of the TV division, Laurine Garaude, introduced executive director Yukinori Kida and Sayumi Horie, head of the global content development position and programming department at NHK (both shown above this post). “The story is basically about the conflict and love between a massively talented father and his daughter O-Ei,” Kida explained. In 4K, both conflict and colour seem to leap out. Following the film—as much a study of contrasts as the painting style O-Ei saved her passions for—we were treated to a brief panel, moderated by Julian Newby and featuring Aoi Miyazaki—the actress who plays O-Ei—with executive director Taku Kato and executive producer Motohiko Sano. She would later elaborate on how she learned how to paint for the role—”even drawing a single line is difficult!” she exclaimed—which helped her understand the level of genius that defined the lives of O-Ei and Hokusai. Near the end, Newby asked whether the 4K element made a difference in the film’s creation. “The makeup at the end was extraordinary,” Julian marvelled, referring to the vision of a much older O-Ei. 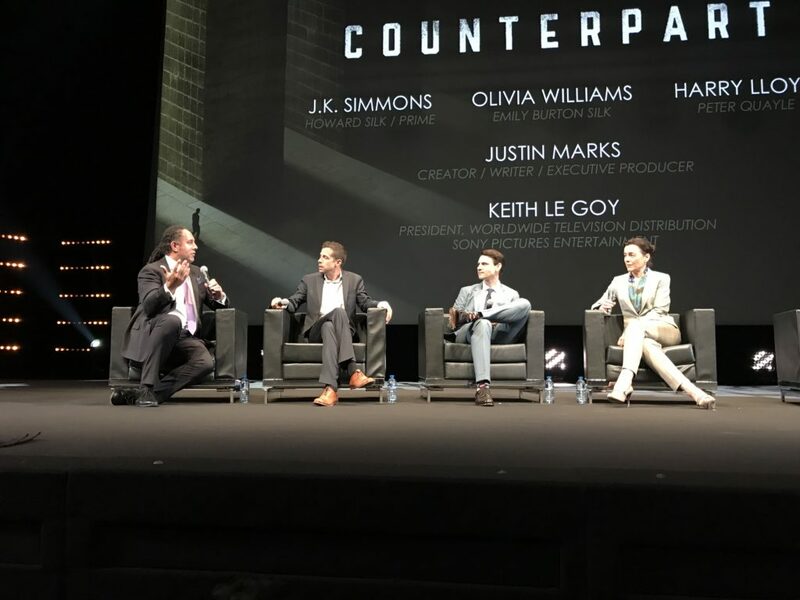 The pre-MIPCOM World Premiere Screening too place on October 15 with Counterpart, distributed by Sony Pictures Entertainment. Oscar-winner J.K. Simmons plays Howard Silk, a lowly cog in the bureaucratic machinery of a Berlin-based UN spy agency which is actually guarding the secret of a crossing into a parallel dimension. Simmons also plays Prime, his ‘counterpart’ from that parallel world, who is significantly more senior and hard-nosed in his agency. Shadowy intrigues and double-crossing shenanigans ensue. Simmons was joined on-stage by fellow actors Olivia Williams and Harry Lloyd, as well as creator Justin Marks and Sony Pictures’ president of worldwide television distribution Keith Le Goy for Sunday’s screening. Williams praised Berlin as the perfect setting for the drama, given its history in the Cold War, and the way the city was split between East and West. “It’s so steeped, so immediate. They’re still in the fallout of the wall that divided the city. The time it takes to erase that and erase those scars. What we’re dealing with, it’s living that truth. It’s an extraordinary place,” she said. Much of the drama will come from the characters meeting their counterparts from the other world. “As the show goes forward we’ll have more opportunities to see characters at odds with their other, and characters who more embrace each other and who love themselves,” said Simmons. “It’s when characters come face-to-face with other versions of themselves, that’s what brings about a change, a catharsis,” said Marks. 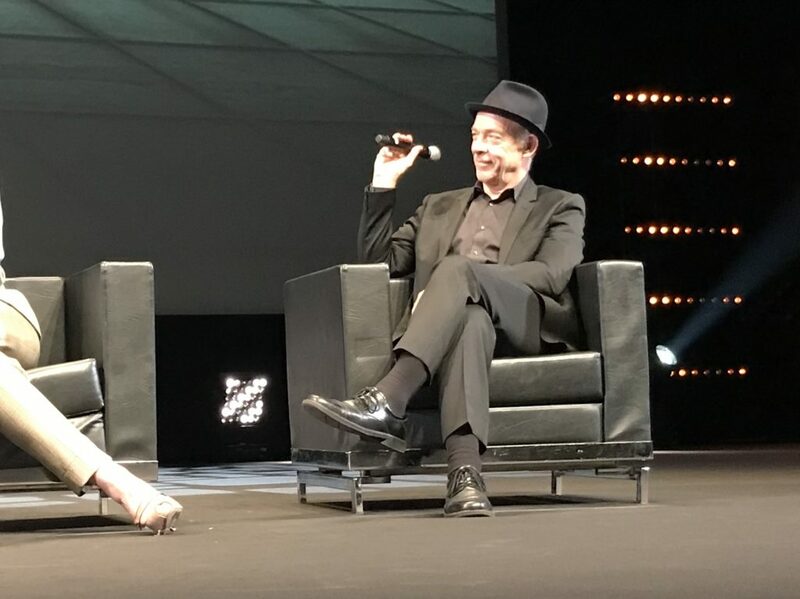 Williams said there are strong emotions to be tapped in all this, citing the two Emily characters that she plays – the wife of Howard and the partner of Prime – as a good example. 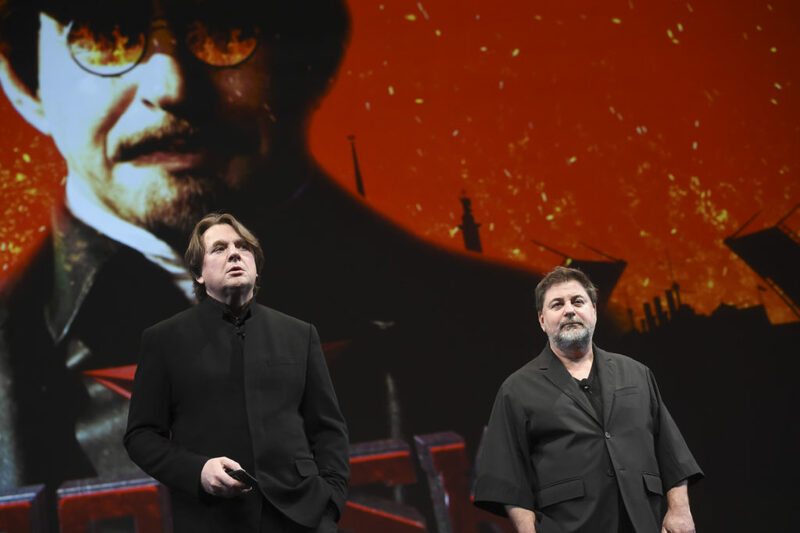 Tuesday night’s World Premiere Screening was for Trotsky, brought to Cannes by Eccho Rights and Channel One Russia. It’s an epic biopic of Marxist revolutionary Leon Trotsky, with his famously complicated romantic life featured as well as his political beliefs. Its stars were accompanied by Channel One boss Konstantin Ernst (right) for a brief Q&A after the screening. Ernst said that Channel One sees drama as a key way to get to the heart of Trotsky and what he stood for. “The best way to understand somebody is to try to tell the story of him,” he said.